Ever since The Jetsons introduced the concept as a viable means of future transportation 1962, America has been obsessed with the idea of the flying car. Hollywood has reinforced the idea in American science fiction via the “airspeeders” commandeered by rebel pilots in Star Wars (1977), “spinners” used by police officers in Bladerunner (1982), and the “DeLorean time machine” featured in Back to the Future (1985). However, movies have usually been too optimistic about their adoption timelines. Back to the Future depicted American cities encircled by autonomous aircraft/cars as soon as 2015, while Blade Runner portrayed a 2019 Los Angeles with multiple vertical levels of car air traffic. (Perhaps Ridley Scott was right, it’s just that the cars he was referencing are sitting on the I-405, rather than suspended in the air.) Regardless, Americans have come to recognize that their desires for a flying car have been vastly outweighed by the utter infeasibility of the idea. Many companies have dismissed the idea of an autonomous vehicle capable of both ground and air locomotion as an impossible undertaking, given regulations, development costs, licensing issues, consumer adoption, and safety concerns. That has all changed in 2017. 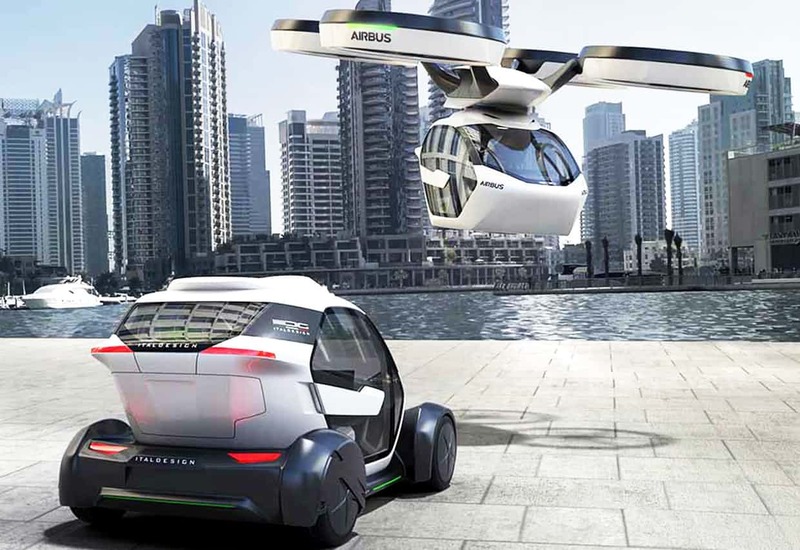 Given the current climate of the transportation industry, as Uber continues to develop its self-driving car and as consumer ground transportation becomes increasingly organized by smartphone apps, the flying car no longer seems preposterous. Specifically, the burgeoning field of artificial intelligence, whose far-reaching applications now include transportation, has enabled companies to consider flying vehicles through the lens of AI. The addition of artificial intelligence and “driverless” technology into the flying car equation has reduced the problem of passenger safety, licensing, and regulation into an algorithm problem. Now the question is: who can develop the flying car first, and how will this thing actually look in everyday life? These are questions that Dubai is actually trying to answer. Dubai, known as the home of the tallest man-made structure in the world, the Burj Khalifa, is also home to the world’s longest driverless metro network. The Dubai Metro, inaugurated in September 2009, is a fully automated and driverless train network that has served 8.8% of all journeys in the city and will serve 12.2% of intra-Dubai journey by 2030, according to Sheikh Mohammed bin Rashid Al-Maktoum, vice president and prime minister of the UAE. The latest development in the city’s “Smart Autonomous Mobility Strategy” is the implementation of autonomous aerial vehicles (AAVs) into the city’s driverless network. 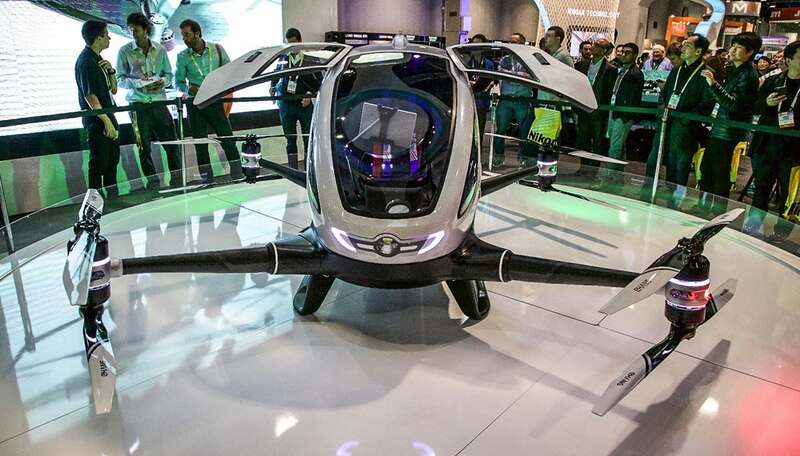 EHang, a Chinese consumer drone company, has developed a fully-electric, quad-copter AAV that can be programmed to autonomously transport people and take off/land via a smart-tablet application. Dubai’s Roads and Transportations authority tested the technology in its skies in July of this year (you can see the video here). 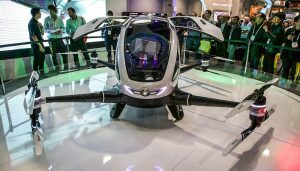 However, despite EHang’s progress in Dubai, there are other significant players worth considering, as each iteration of the flying car has its own differentiating technology. 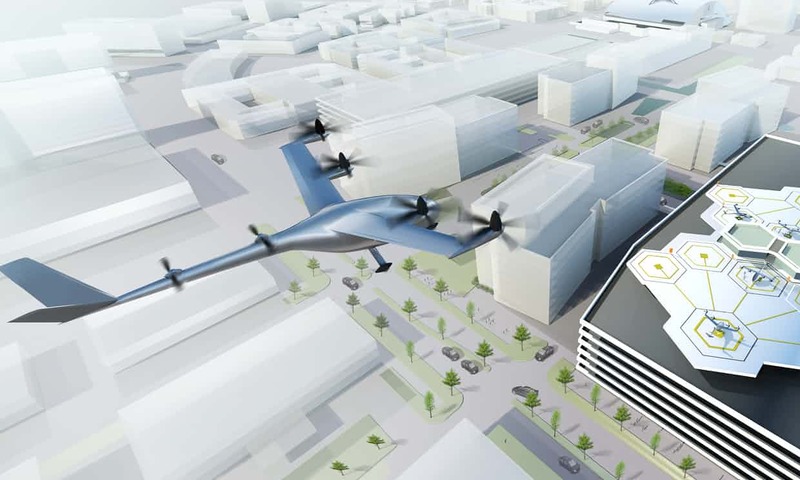 German startup Lilium is developing a “five-seater air taxi jet,” aiming to make its first manned test flight in 2019; its car will be electric-powered and will have a strictly vertical takeoff and landing procedure. Similar to Lilium, Airbus is developing a two-seater, electric “multi-modal vehicle,” that will use advanced AI to enable passengers to select the fastest, cheapest route. Uber, of course, is pursuing a similar technology in its “Elevate” project, whose vehicles will use “distributive electric propulsion (DEP)” that will be “barely audible,” making it ideal for inconspicuous transportation in urban environments. In contrast, the American Terrafugia Transition is a “roadable aircraft” that runs on unleaded gas, requires a 20-hour pilot certification to drive, and takes off and lands like a traditional airplane. And last, but not least, is the Slovakian Aeromobil, which perhaps strikes the best amenities compromise of the bunch. The Aeromobil utilizes electric on the road and aircraft fuel in flight, takes off and lands vertically, and boasts a conversion time from car to plane of three minutes, much like a traditional convertible. The race to the flying car has officially begun. The makers of the Jetsons saw this coming as far back as fifty-five years ago. However, what they didn’t account for was the sheer variety of flying cars ideas making waves in the current development market. 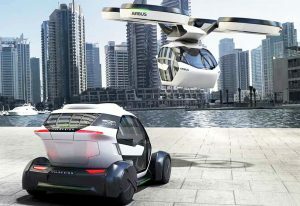 It seems that we will be enjoying a variety of AAV and flying car options in the coming years. Scott N. Beck, a Dallas Texas Greenhill alumni, received a Masters of Accounting from the McCombs School of Business at the University of Texas at Austin where he completed his B.B.A. Mr. Beck is a member of the Board of Directors of United Texas Bank and is President of Beck Ventures. Scott nice post. I just stumbled upon your blog and wanted to say that I’ve really enjoyed browsing your blog posts. I like concept cars. Thanks for sharing. I’ve enjoyed your blog posts. I agree with you. This post is truly inspiring. I like your post and everything you share with us is current and very informative. Woah! I’m really loving the template/theme of this site. It’s simple, yet effective. A lot of times it’s very hard to get that “perfect balance” between superb usability and visual appeal. I must say you’ve done a very good job with this. Additionally, the blog loads very fast for me on Safari. Exceptional Blog! The post is truly interesting and i like you post and everything you share for flying taxi. Thanks for sharing. very interesting article! I will follow your website.Thank you, I have been searching for facts about this topic. Hi Scott, Thanks for great article, technology are gradually changing.